Yellowstone supervolcano has the potential to envelop the US in a ‘nuclear winter’ which would leave 90,000 people dead almost instantly the moment it erupts. The giant volcano has been dormant for over 70,000 years, and scientists say there is a possibility that it could erupt one day. It is one of the largest active continental silicic volcanic fields in the world. Silicic is used to describe magma or igneous rock rich in silica. Experts say there is a one in 700,000 annual chance of a volcanic eruption at the site. An in-depth report by HowStuffWorks has revealed the process that would take place if the volcano were to blow. It says that a mixture of magma, rocks, vapour, carbon dioxide and other gases would eventually push out from the ground, creating a dome shape with cracks. The dissolved gases would them explode, releasing the magmaacross the park. The eruption, the say, could kill as many as 90,000 people almost instantly and release a 10 ft (3-meter) layer of molten ash 1,000 miles (1,609km) from the park. ‘The ash would block off all points of entry from the ground, and the spread of ash and gases into the atmosphere would stop most air travel, just as it did when a much smaller volcano erupted in Iceland in 2010,’ the magazine writes. ‘Sulphuric gases released from the volcano would spring into the atmosphere and mix with the planet’s water vapour. It adds that falling temperatures would damage our food supply, destroying crops and causing a worldwide food shortage. But not every believes a Yellowstone eruption would be as catastrophic as this. Last year, a study by the United States Geological Survey (USGS) concluded that a volcanic eruption at Yellowstone would cover cities across the country with ash and shut down air travel and communications. But it added that it would not herald the end of the United States as we know it, as the latest report has claimed. The scientists used the program called Ash 3D to model the effects of a Yellowstone ‘super eruption’ and found that cities up to 300 miles from the park would be covered by up to three feet of ash. Cities further afield in the Midwest would be covered by a few inches and coastal cities such as New York and California would get only a fraction of an inch. An eruption at Yellowstone would create an ‘umbrella cloud’ of ash which would expand evenly in all directions driven by the force of the seismic event. ‘In essence, the eruption makes its own winds that can overcome the prevailing westerlies, which normally dominate weather patterns in the US,’ said Larry Mastin, the lead author of the new paper. Even these smaller levels of ash would be a disaster for the US. The USGS study says that electronic communication and air travel throughout the country would be shut down by an eruption. A huge cloud of ash thousands of miles across would also likely cause a year-long winter, say the study authors. 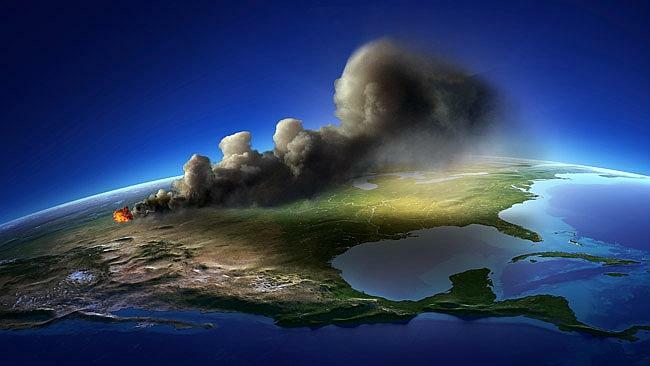 The 1815 eruption of Mount Tambora in the Pacific produced an ash cloud tens of miles across caused ‘a year without a summer’ across the globe with snowfall in the North Eastern United States in June. Areas covered in feet of ash would see buildings at risk of collapse and sewer and water lines blocked, and winds would form large dunes of ash that would cover roads and buildings. Farming in the Midwest would be devastated by the cloud of ash, and highways across the country would become slippy and treacherous. The Yellowstone volcano has had three super eruptions – which produce more than 240 cubic miles of ash’ in the past. One was 2.1 million years ago, another 1.3 million years ago and a third 640,000 years ago. Ash from these eruptions has been found across the US on the east and west coasts. The last volcanic activity at Yellowstone was 70,000 years ago which produced a lava flow in the south of the park. In April, scientists at the University of Utah discovered an enormous secondary chamber deeper beneath Yellowstone National Park that’s so large it is partly-molten rock could fill the Grand Canyon 11 times over.